Robust content: Access more than 10,000 clinical topics spanning more than 20 medical specialties that you can access at any time and from anywhere. Trusted treatment recommendations: View information that is written and reviewed by more than 5,700 world-renowned physicians. Patient information: Enhance shared decision-making with nearly 1,500 patient education topics. Drug information: Get information on more than 5,200 individual drugs. Each entry includes adult and pediatric dosing information, uses, interactions, international brand names, contraindications, IV compatibility, and more! Drug interactions database: Enter a list of medications (prescription, OTC, or herbal) and Lexi-Interact™ will assess their compatibility. 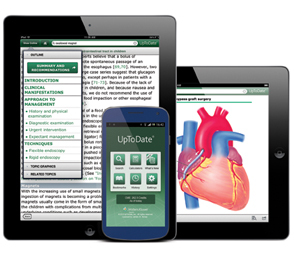 Mobile Apps: With unlimited online access to clinical answers from a computer, mobile device or tablet through our highly-rated FREE Mobile Apps, you can find the information you need - anytime, from anywhere. With renewal of your personal subscription, upgrading to UpToDate® MobileComplete™ is just $49 for one year*. For more information, click here. Graphics search: You can search specifically for graphics from our search box. UpToDate contains more than 27,000 pictures, tables, illustrations, diagrams, movies, algorithms, and graphs. Medical calculators: More than 140 calculators eliminate the need for you to remember formulas or use separate devices.